BSA made its first motorcycles in 1910 after carving out a solid reputation in the world of two-wheelers. It became one of the largest British companies in 1925 offering a 13- model range in five engine sizes ranging from 250 to 1000cc. 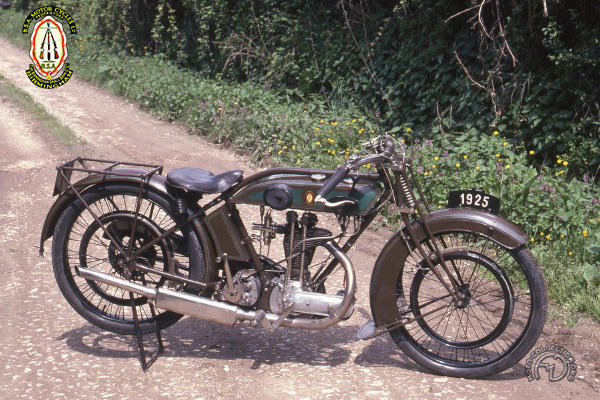 BSA's 350cc sidevalve launched in 1923 was rapidly followed by the 350cc L24 with overhead valves and a sidevalve 250, which beat all sales records, with 35,000 units registered during its four-year production span. The L24 (the figures in BSA model names indicate the year of production) was the first BSA with overhead valves and was good for some 50 mph. It still had the long-stroke dimensions of the original sidevalve 350 (which BSA would conserve until 1933) but had a detachable cast-iron cylinder head with generous firming and duralumin rockers. Lubrication was by mechanical pump, supplemented on gradients by a hand-pump. Apart from its belt-rim brakes, the BSA L24 was very advanced for its day, and had few rivals. The 350 Sports of 1925 also had a Super Sports version and a 500cc derivative offered Sports and Colonial models. The L25SS had a special forged-steel crankshaft with balance weights, while the compression ratio was raised to 6.8:1 so that it could operate on a mixture of gasoline and benzol. Each L25SS was bench-tested at 5600 rpm and was guaranteed to exceed 70 mph. Power Rating: "over 13 hp"
A reliable performer, the 350 L25 was the foundation on which subsequent generations of BSA were based.